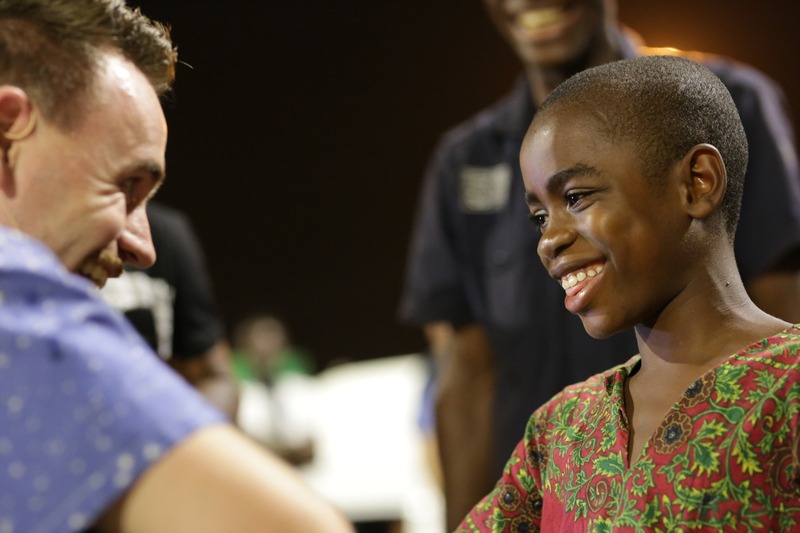 Take a look at the heartwarming images from our most recent campaign in Ivory Coast, including the touching moment of a blind man who could see again in the rain! This is why we do what we do. Your support and prayers make this possible. Thank you!!! The campaign ended yesterday with more than 30,000 visitors on the last evening. We are in a very special place. People don’t talk much about it, but the land has just recently been through a civil war, with many casualties. Yesterday I spoke on how Jesus conquered death and how you can be sure of having eternal life. It was very healing for many people. The line of people who wanted to share their testimony was very long and we didn’t have enough time to hear all of the stories. 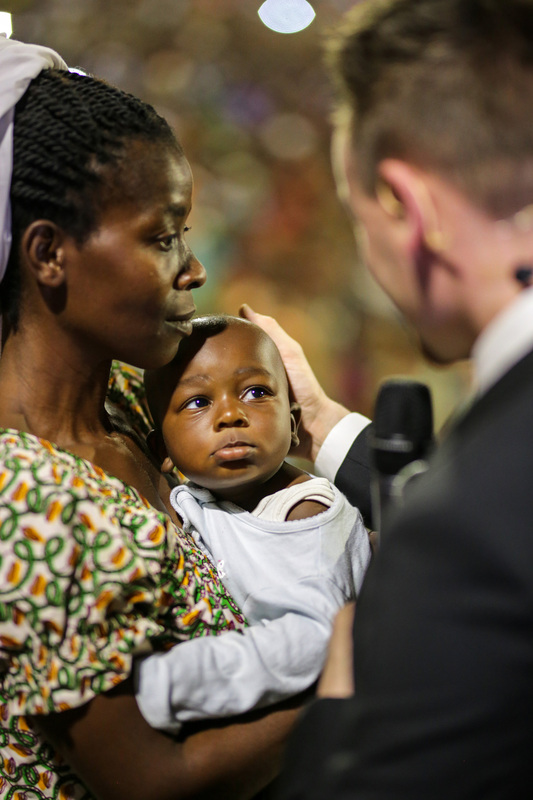 People testified of all kinds of miracles. All glory is for Jesus! Our team was showered with gifts from the churches, as they showed us their appreciation. I am incredibly proud of everyone in our team. They have worked so hard – (we are a group of twelve) on setting up and taking down the structure, the sound system, the organization, video, photography – they are amazing and without them we cannot do this work. Not everything went smoothly and some of our team members have been unwell because of the heat and the new food. Will you pray for safe travels on our way home? During the last evening I am always able to pray a prayer of blessing. This is a special moment and you can see it live on my Facebook page: You will love it! For now, I want to give you a warm greeting. Thank you for all of your prayers and responses. I am looking forward to the warmth of home and the holidays. I do not know how else to describe it. Yesterday was all about the Holy Spirit. Yesterday morning, we closed the leaders conference with prayer and it was so amazing to witness how God was touching people and encouraging them. Thankfully it was dry last night, thank you for your prayers. The crowd of people grew significantly last night and once again thousands heard and accepted the gospel. The message that you are forgiven, loved and that God has seen and accepted you, is universal and irresistible. That is what draws so many people to the cross of Jesus again and again. After we had prayed for the baptism by the Holy Spirit, an incredible, outrageous joy just exploded, and believe it or not – we white people, got swinging to the rhythm of the music. That was the highlight of the celebrations, as we, moving like wooden puppets, but with a good heart, joined in the festivities. We give glory to God for the many testimonies that we heard yesterday. 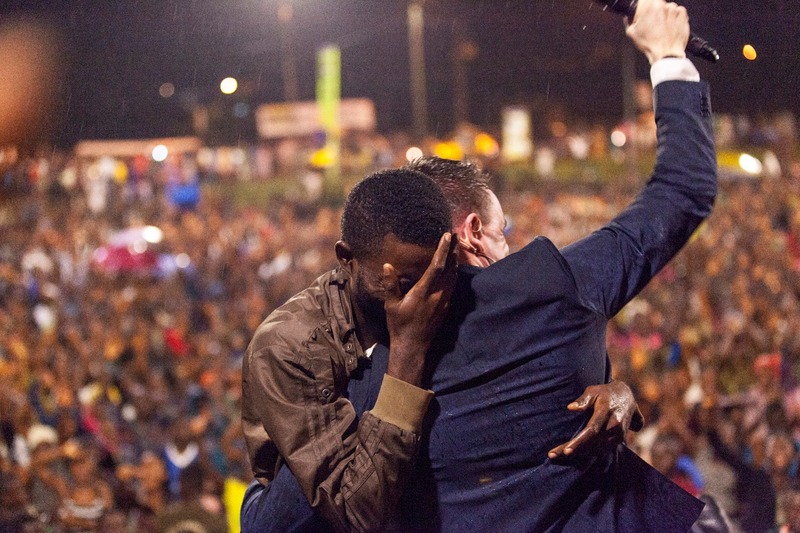 Sunday will be het grand finale; we look forward to the whole city coming to hear the gospel. Blind man can see in the rain! I am still a bit in awe – it last night was amazing! Yesterday it started to rain suddenly. Because of the rain it took a little longer for the campaign evening to get started. I shared on the blood of Jesus and how Jesus will set you free from all of the attacks of the enemy. Just as I started to pray for the sick, it began to rain again. Internally I struggled with thoughts of discontinuing the meeting. The people just stayed there! In the pouring rain! They were so hungry for the Word of God. I decided to pray for the sick anyways, after many people had given their hearts to Jesus. We worshipped God in the rain and all over the place people started to pray for each other. I saw how a woman prayed for a blind boy, and if front of my eyes I watched him be healed and Jesus opened his eyes! 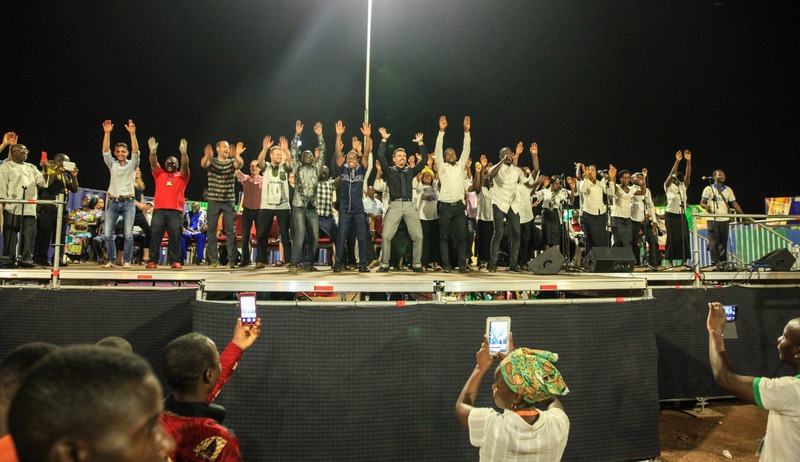 The crowd exploded in joy, because even in Africa, these things don’t happen every day. The young man came to share his story on the podium and fell into my arms, full of emotions. This moment was recorded live and can be seen on my Instagram story line. With just two more days to go, we are looking forward to what God is going to do. Thank you for your prayers. We pray that the city would come to hear the gospel and that the weather would be dry through the weekend! We do not have a roof over our heads here at the campaign grounds, but if we did, it would have been blown off! When you exalt Jesus, you blow the roof off. (Even though we don’t have a roof over the campaign grounds). The praise of God’s children rises up to Heaven. Last night thousands of people made a conscious choice for Jesus. One of the leaders pointed out that it is so important that campaigns are held in Ivory Coast. The north of the nation was separated for a while from the south and was led by a group of rebels. You can still see the consequences of that time. That is why God’s Word is so needed here; it brings healing, hope and restoration! There were several testimonies last night that filled our hearts with joy. The day before yesterday I was able to pray for a boy who had been tormented by epilepsy for many years. Due to the epilepsy he was unable to walk and could not sleep well at night. We met each other on the podium the day before yesterday and I prayed for healing. Last night he came with his father and told us that he had walked from and to the campaign grounds himself, and had slept until 10AM that morning, which was highly unusual for him. The glow on his face said it all. A lady testified that a tumor in her breast had disappeared. And during several testimonies on the podium, people broke out in cheers at the back of the field. A boy who was deathly ill, so sick that he could not stand, just skin over bones. He stood up, and walked with great strength and vigor to the podium! Everyone was amazed! It is amazing here and I want to thank everyone for their prayers. More beautiful things lie in store for us. Have faith in God! He really does love you very much! It is great to be back in Africa! We are in a new country, Ivory Coast, and a new city, Gagnoa. The atmosphere is really good! Today we received a warm welcome from the mayor and the prefect. The goverment is very supportive, and to reinforce that position, there were government delegates present at the opening of the campaign last night. More than 17,000 people heard Jesus’ loving message last night! Thousands flowed into the Kingdom and said “Yes” to Jesus. People kept asking me: “Why have you come to Gagnoa of all places?” I am not really sure, but I think it was on God’s agenda and that much has become obvious now that we are here. We have encountered opposition on so many fronts, but in Him we are more than conquerors! We want to thank everyone that has decided to help us through prayer and support for this campaign. The first testimonies of changed lives were already shared last night. An elderly lady had partially lost her sight and could no longer see things at a distance. She had been to see traditional medicine doctors, but nothing helped. Her son brought her to the campaign and all of a sudden she cried out: “I can see a podium! And I see a white man!” Jesus opened her eyes. Another woman was unable to walk due to a tumor. Someone carried her to the campaign, but last night she jumped and ran across the podium to tell everyone what Jesus had done! A third woman came to share how her baby’s fever had dissapeard. All signs of God’s goodness. Will you join us in Africa with your prayer, support, your “likes” and responses? Thank you! It means a lot to us.